Terming the complaint by Congress to Election Commission of India (ECI) regarding irregularities in registration of votes in the state as a political stunt, the Punjab Chief Minister Mr. Parkash Singh Badal today said that the Congress was trying to score brownie points before media by raising such irrelevant issues.Interacting with the media persons on the side lines of death anniversary of Sant Baba Prem Singh Ji Muralewale here today, the Chief Minister said that Congress party was indulging in such political tantrums just to mislead the people of state. He said that there was hardly any truth in these allegations of Congress party adding that these were just figment of imagination of Congress leaders, who were vying to attain political power in the state. “These allegations were baseless and hardly have any legal standing” added Mr. Badal.Slamming the Congress party for defaming the state on fiscal front, the Chief Minister said that the financial position of the state was very sound and the proof of which was that unprecedented development was taking place in the state. He questioned the entire opposition that was it possible for any state to execute such massive development works if there was any shortage of funds. Mr. Badal said that in reality the state government was having enough funds to carry on development and pro-poor schemes in the state.Reiterating the firm commitment of the SAD-BJP alliance to maintain communal harmony, peace and brotherhood in the state, the Chief Minister said that nobody would be ever allowed to disturb the hard earned peace in the state. He said that the state government was keeping a strict vigil over every incident in the state and no sort of laxity was being adopted in it. Mr. Badal said that though crime was a universal phenomenon but then also the state government was duty bound to maintain law and order in Punjab at any cost.Asked to comment on Sikh Preacher Sant Ranjit Singh Dhadrianwala’s demand for CBI enquiry regarding attack on him, the Chief Minister said that the state Police was competent enough to investigate the entire matter. He said that the state Police must be allowed to complete its enquiry in a fair manner.Expressing concern over the infighting in some units of Shiromani Akali Dal, the Chief Minister said that the leaders and workers of party must maintain discipline of the party at very cost. He said that every matter must be discussed on party platform and should not be raised in media. Mr. Badal said that however the President of SAD would take appropriate call on this issue. 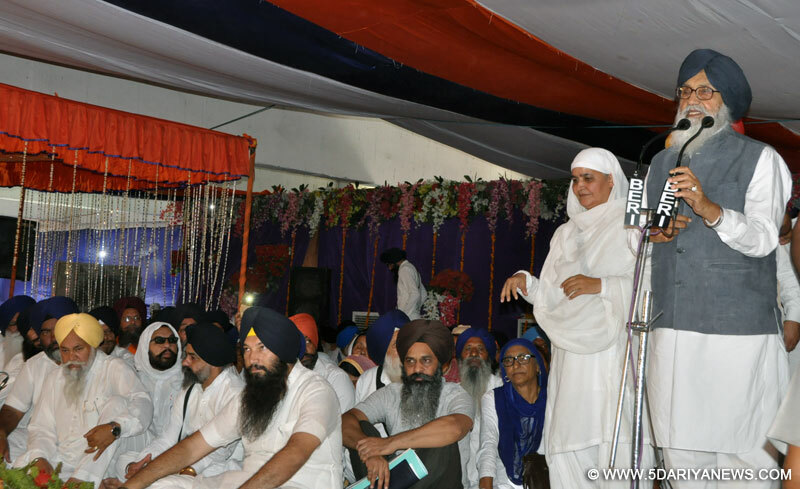 Later on the Chief Minister, while addressing a mammoth gathering, paid rich tributes to Sant Baba Prem Singh Muraalewale and recalled the marvelous services rendered by him in the religious, educational and social field. Mr. Badal said that the state government has taken unprecedented steps for perpetuating the rich legacy of the state by constructing several world class iconic memorials across the state. He also listed the path breaking initiatives taken by the state government for providing basic civic amenities in urban and rural areas of the state. The Chief Minister recalled the enormous contribution of Punjabis in making the country self sufficient in food grains besides acting as sword arm of the country. However, he said that the successive centre governments led by Congress has not recognized the immense contribution of Punjabis and inflicted a severe blow to economy of state by meting out step motherly treatment to the state. Taking the Congress party to cudgels, the Chief Minister said that the Punjabis could never forgive the Congress party for its sins against Punjab, the Chief Minister said that Congress has irrelevantly meddled in the social, political, economic and even religious affairs of the state. He further bemoaned that the Congress governments at the centre had deliberately denied the state of Punjabi speaking areas, its capital Chandigarh and even its legitimate share in river waters. “How can any true Punjabi forget and forgive Operation Blue Star and the killing of innocents in 1984 anti-Sikh carnage” questioned Mr. Badal.Urging the people to beware of nefarious designs of Congress and AAP to deprive the state of its river waters, the Chief Minister said that both these parties were hell bent upon ruining the state. Mr. Badal reminded the people that while Congress had signed various water agreements to deprive state of its waters, the AAP was now trying its level best to ensure that these agreements were implemented at the earliest. He asked the people to remain cautious of the tantrums of these people as there would be no prosperity without water. “On this sacred day I urge you to make a solemn pledge for making any sort of sacrifice to protect waters of the state” added Mr. Badal. In his address Deputy Chief Minister Mr. Sukhbir Singh Badal said that whenever the Punjabis have given mandate to Mr. Parkash Singh Badal to run the state, Punjab had witnessed unprecedented development. He said that every major development work in the state has an imprint of Mr. Parkash Singh Badal, who has zealously and dedicatedly served the state throughout his life. Mr. Sukhbir Singh Badal said that in last more than nine years of SAD-BJP rule Punjab has witnessed unparalleled development adding that Punjab was probably the only power surplus state in the country due to concerted efforts of the state government.Paying rich tributes to Baba Prem Singh Ji Muraalewale, the Deputy Chief Minister termed him as an institution and recalled the role played by Baba Ji in the religious, educational and social field.Prominent amongst other present on the occasion included MLA Bibi Jagir Kaur, Chairman MARKFED Mr. Jarnail Singh Wahid, Special Principal Secretary to Chief Minister Dr. S Karunaraju, Inspector General of Police Mr. Lok Nath Angra, Deputy Commissioner Mr. Jaskiran Singh and Senior Superintendent of Police Mr. Rajinder Singh.